From the convenience of your phone, you can explore everything about your relationship with your sponsored child. Write messages and send gifts when you're out and about. Receive helpful birthday reminders and letter notifications straight to your phone. 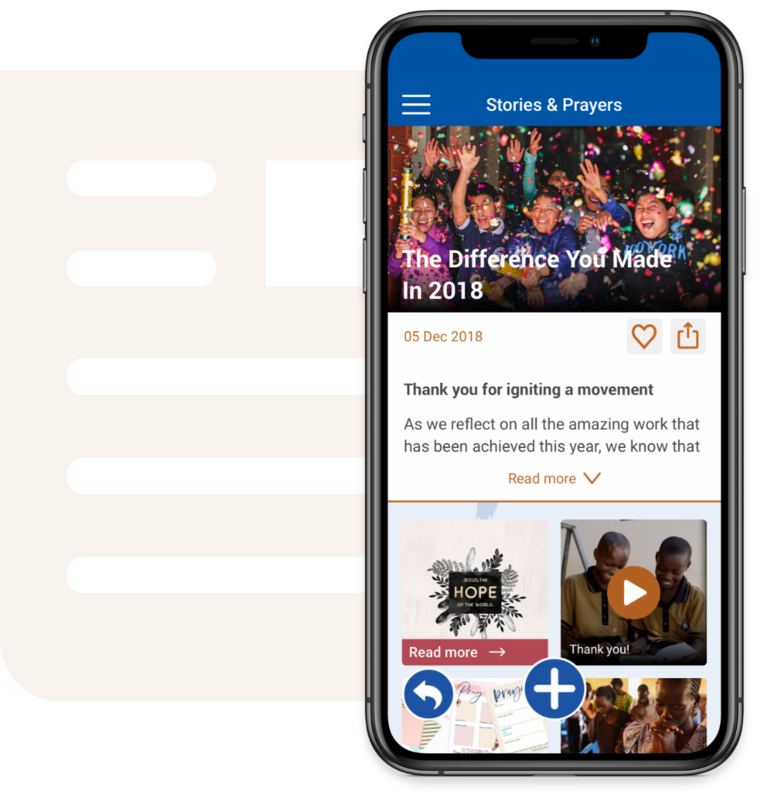 What's more, the app keeps you up to date with exciting news from the wider work of Compassion. Read inspiring blog posts and pray into the latest needs from children and our church partners. The home hub gives you a snapshot of your sponsorship, plus your daily dose of inspiration with stories, videos, Bible verses and prayer points. 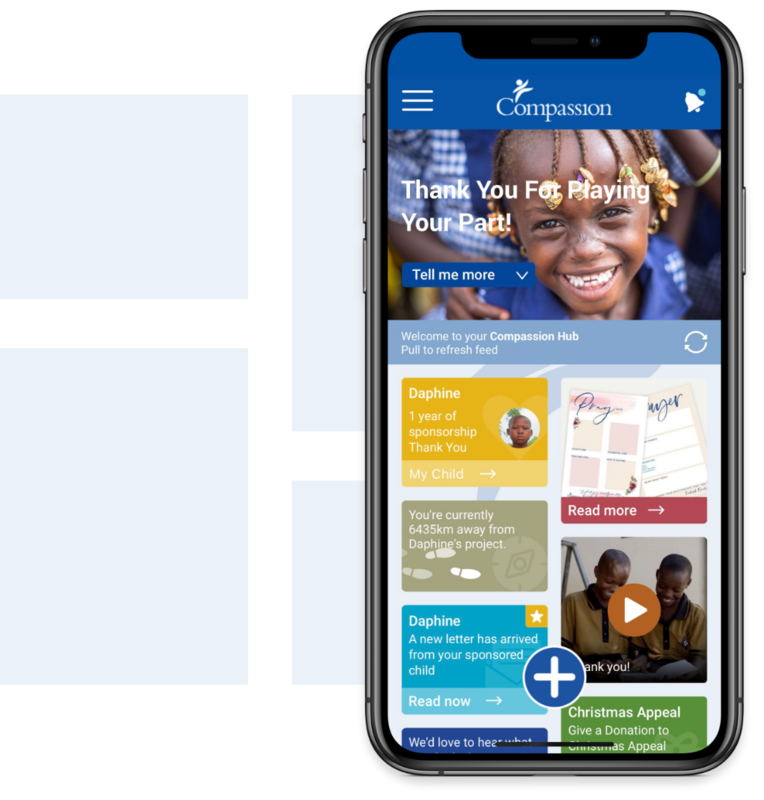 Learn about your sponsored child's community and even discover the approximate direction of their project with our innovative compass feature. You can easily give a birthday, child or family gift on the app. Plus, you can opt in to receive helpful reminders about your sponsored child's birthday. 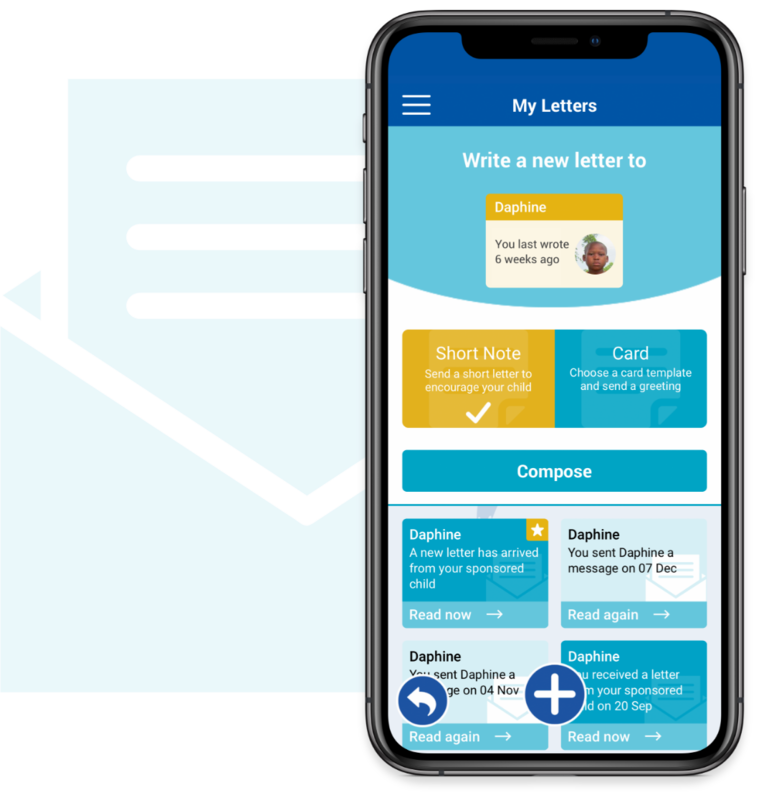 We've made it even easier to encourage your sponsored child - whether you're on the train or in the supermarket queue, it only takes a few clicks to write a letter or card. Be the first to read the latest story of lives changed. Watch moving videos and get equipped with poverty news from around the world. The new Compassion App is stunning. It’s amazing. I’m so excited to connect in this way to my sponsored child in Rwanda. Brilliant app, extremely useful and easy to use. Thank you team. Five stars. The app is fantastic! Seeing an up to date photo of my child, it was such a joy to see how much he has changed and progressed in a year! I’ve also made a gift this morning as it was so easy to do. The app is very easy to use even for a technophobe like me! Love the fact I can see a record of all the letters to and from my sponsored children plus extra info re the country they live in. Lots of interesting short videos too re Compassion’s work all in one place. Brilliant! There’s so much you can do on the Compassion app. It’s easy to access everything you need on your sponsor child. I love the layout. It’s very user friendly. I love the extra options for praying for your child, verses to read. I found it has made it much easier for me to correspond with my sponsor children. I’ve found this to be one of the best apps I’ve used. We're in the early stages of developing this exciting new tool. We'd love you to be one of the first to explore the app and share your thoughts. We would love to get your feedback to help improve the app experience for all our sponsors. Whether you've spotted a bug or have an idea you'd like to share we would love to hear from you. Need some help? Our App FAQs are a great place to start. Yes! We’re delighted to announce that the Android version of the Compassion UK App is now available. Please visit the Google Play store to download the app onto your Android device. We’d love to know your feedback as your start to explore this new app. We hope it blesses your relationship with your sponsored child. When you first load the Compassion UK App, you’ll arrive in your home hub. Here you’ll find the latest exciting stories, videos and prayer points. On your first visit, you’ll need to follow the Welcome Tour and log in to your myCompassion account. Once you’ve logged in, your home hub will also fill with encouraging information and photos of your sponsored child. Click on any tile about your sponsored child and you’ll be taken through to your child hub. Your child hub contains everything you need to engage with your sponsored child. Browse through their photos, read about their life and community, discover more about what they’re learning at their Compassion project and even discover approximately how many steps you are away from them! Please note that for safeguarding purposes, we do not provide the precise location of the child or their project. Find links to write, pray and give to your child. Discover when you last wrote to your sponsored and browse previous letters and cards. Choose to write a short note or card to your child and encourage them today. Be inspired by the incredible part you’re playing in the wider story of releasing children from poverty. Watch the latest videos, read stories and take a moment to pray for some of the world’s most vulnerable children. 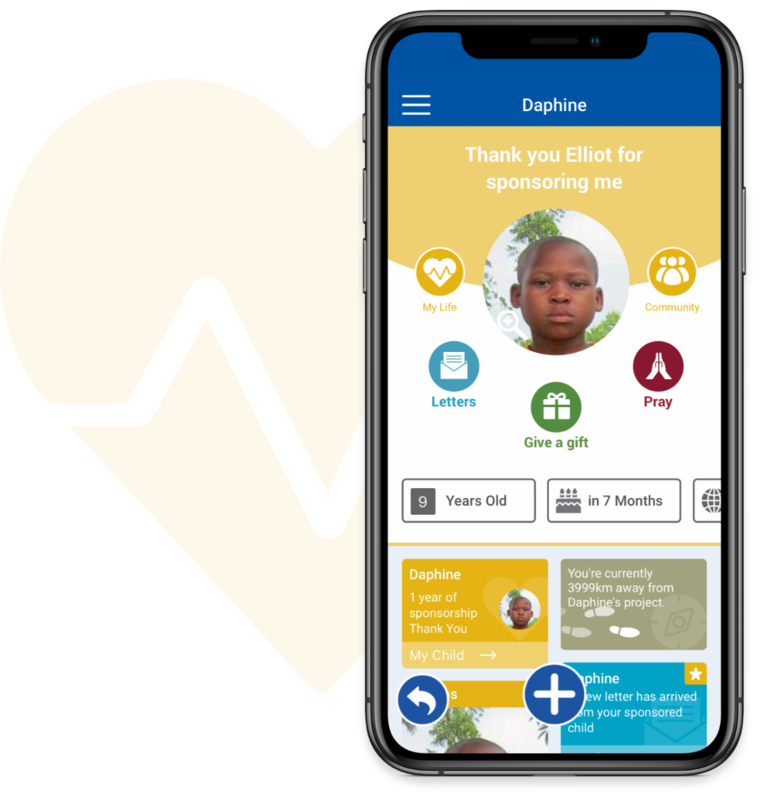 Wherever you are in the Compassion app, you can click the plus button at the bottom of your screen and quickly and simply write, pray and give to your sponsored child. If you’ve never registered for an account before, you can set one up here. The Compassion UK App is available to download free today for iPhone and Android.